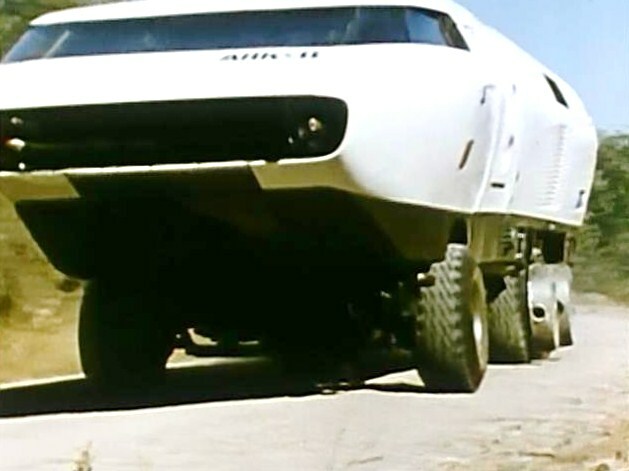 In “The Drought,” the Ark II goes in search of a time capsule containing a pre-apocalypse “cloud seeder” to help avert a deadly drought in the nearby desert. 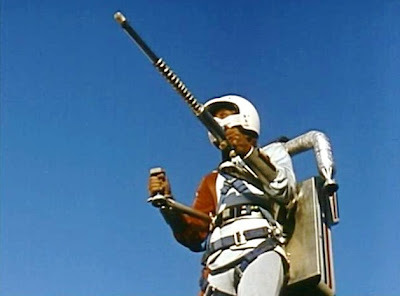 During the mission, Samuel programs the Ark II to run on voice control. This proves a poor selection when the crew’s old nemesis, the scoundrel Fagon (Jonathan Harris) stages a trap for Jonah and steals the vehicle. Fagon helps to free the trapped crew members and show the witch-doctor the error of his ignorant ways. The Ark II continues on its mission, and this time, Samuel programs the vehicle to respond only to the voice commands of the vehicle’s crew. 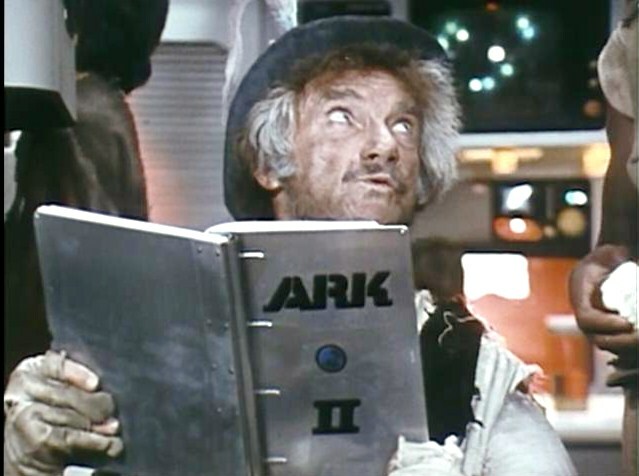 Jonathan Harris guest stars here as the Ark II equivalent of Harry Mudd, a selfish, roguish man who proves a constant foil for the good-intentioned Ark II team. 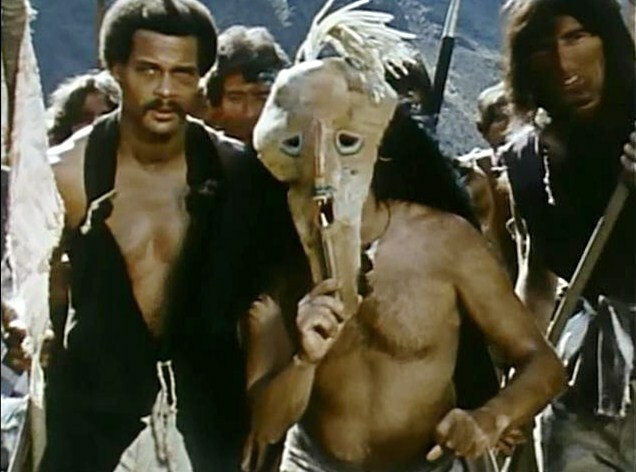 What remains a little baffling about this episode is that Jonah and the others allow Fagon to attain a position of authority in the witch doctor’s community. He promises to teach the villagers “irrigation” methods, but this is a variation of what he promised in “The Flies.” There, he assured Jonah he would educate the wayward youngsters, but we see in this episode that he did no such thing. So why would Jonah trust him again now? There’s an old saying: Fool me once, shame on you. Fool me twice, shame on me. There’s every reason to suspect that Fagon will remain just as foolish and selfish in the future as he has been in the past. This is hardly “mission accomplished” and the unsatisfactory conclusion of “The Drought” only points out again the kind of amorphous missions that the Ark II conducts. The crew’s goals and rules are not always clear or carefully established. Accordingly, it hardly seems like good procedure to leave the untrustworthy Fagon in charge of an important project. In terms of Ark II technology, this episode introduces the “magnetic force beam” – a kind of tractor beam – that Fagon utilizes in order to steal the cloud seeder. He gains the knowledge by using the Ark II’s technical manual…which looks a lot like a script book. John good review. Even with all the missteps of this episode[voice command ArkII] I still like the Oliver Twist nod of Jonathan Harris playing Fagan. Based on the actions of the Ark II crew I think they put too much faith in people changing their ways, but the unfortunate reality is that once the Ark II departs the area, as you stated, Fagan will go back to his old ways. I always thought that the Ark II primary mission should have been to reestablish civilization by setting up a planetary communications network basically to leave a ‘communications device’ with each and every village they encounter so they can keep track of everyone. As for the ARK II TECHNICAL MANUAL that Fagan was reading[what a brilliant product placement for it being sold in book stores], as a boy in ‘76 I would have loved to have purchased a copy of this to go with my Star Trek Technical Manual by Franz Joseph Schnaubelt and my Starlog published Alpha Moonbase Technical Notebook. I have always been obsessed with science-fiction production design because it is what first attracts me to a series or film. Filmation never established good merchandising for their ARKII/SPACE ACADEMY/JASON OF STAR COMMAND trilogy, just some oversized SA dolls and minor things. I endlessly searched and I was constantly disappointed as a boy in the ‘70s that these three series never had model kits based on the Ark II/SA/Seeker/Starfire , playsets with action figures based on the Ark II/SA/Seeker/Starfire [like Mego Buck Rogers with action figures or Kenner Star Wars with action figures sizes]. So desperate in the ‘70s that I scratch built an ArkII , Seekers and Starfires. I know that this ARK II Technical Manual and a Space Academy/Star Command Technical Manual [I never saw on either series, you think the SA Cadets would have had them as a text book for a product available in book stores.] would have been on my must have list. I agree with you about Jonathan Harris playing Fagon. It's a nice literary touch, to be certain, even if I have quibbles about the fact that the Ark II crew didn't keep a closer eye on him. I love your idea for a continuing mission: setting up a communications network. That would have given the team a specific and worthwhile purpose, rather than these kind of hazy, nebulous assignments they go on, and which seem to have little lasting impact. That would have been a GREAT idea. I also share your disappointment that no model Seekers, Star Fires or Ark IIs were ever to be found on toy store shelves. What a missed opportunity for Filmation! And like you, I would have loved a Space Academy/Star Command or Ark II Technical Manual. Thank you for commenting on my review, my friend.